Cagey Critters – A New Shop! I’ve been working on a new project over the last couple of weeks and it’s taken much longer than I was anticipating. I’ve been holding off on working on anything else until this one was finished, but if I had known it would take WEEKS instead of days? Yeah…might have rethought that whole plan! At any rate, it is finished now (almost) & ready for the big reveal – TA DA!!! 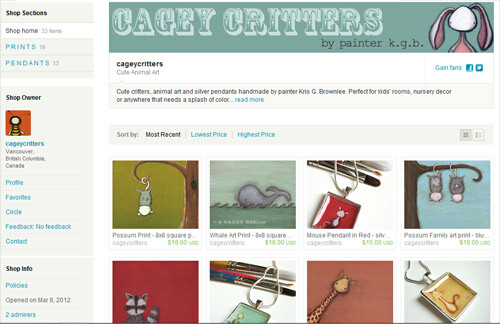 I started a second Etsy shop to house all of my silly critter prints, paintings and silver pendants – Cagey Critters. Huzzah! My main shop was starting to feel a bit convoluted with so many items (5 pages worth!). Because the style of the silly critter animal paintings is so different from my wide-eyed girls, it felt like they needed their own home. Seeing them all on a page with the silver pendants mixed in looks so much more cohesive and much easier to browse if that’s the style you’re looking for. I can just imagine someone stumbling onto my bright teal rabbit print & then poking around the shop looking for another print to pair it with for decorating a kid’s room. And then finding…Richie Tenenbaum? Or my Day of the Dead print? Not helpful! So what started out as a little housecleaning project ended up bogging me down for weeks as I figured out a name, fiddled with a banner, photographed all of the silver pendants & then edited those photos (which reminds me…I’m missing the monkey silver pendant. Whoops!). 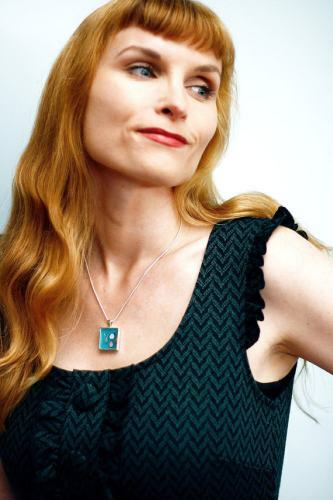 I think it helps to have a few shots of a model wearing jewelry too so that you can accurately gauge the size of a pendant. Shooting self-portraits where you’re trying to have a tiny piece of jewelry in focus? And not look like a dork? And you’re on your balcony where the light is better & it’s really cold out still & your nose is starting to run? Yeah. That’s the glamorous world of Etsy! Minor whinging aside, I am quite pleased with the way the new shop turned out. It will be interesting to see how running 2 separate shops goes. People say that it’s twice as much work since you have to double your marketing efforts, but at least the marketing can be more targeted. For kids’ rooms and nursery decor, I can direct people to the Cagey Critters shop. A lot of my other work does end up in kids’ rooms too (like the robot print or the Where the Wild Things Are print), but it’s usually a bit older & definitely appeals to a different decorating style. Let me know what you think! Any glaring errors or major mistakes? Do the images look weird on your monitor?